Abstract. The role of mast cells (MC) in tubulointerstitial damage in glomerulonephritis (GN) is not fully understood. The distribution of MC was compared in renal biopsies from 50 patients with different stages of rapidly progressive GN (RPGN) and in 20 control samples. The immunoreactivity of renal MC with anti-tryptase and anti-chymase antibodies was studied. Interstitial myofibroblasts were stained with anti-α-smooth muscle actin (α-SMA) antibody, and inflammatory cells were identified by anti-CD3, -CD20, and -CD68 monoclonal antibodies. Positively stained cells were counted, and the relative interstitial and fractional areas of anti-α-SMA-stained cells were measured. MC were rarely found in control samples. In contrast, samples showing crescentic GN contained numerous tryptase-positive MC (MCT) (43.7 ± 4.65 versus 7.14 ± 1.3/mm2) and fewer tryptase- and chymase-positive MC (MCTC) (13.8 ± 1.86 versus 1.89 ± 0.86/mm2) in the renal interstitium but never in the glomerulus. Double immunostaining demonstrated the presence of both phenotypes of MC. 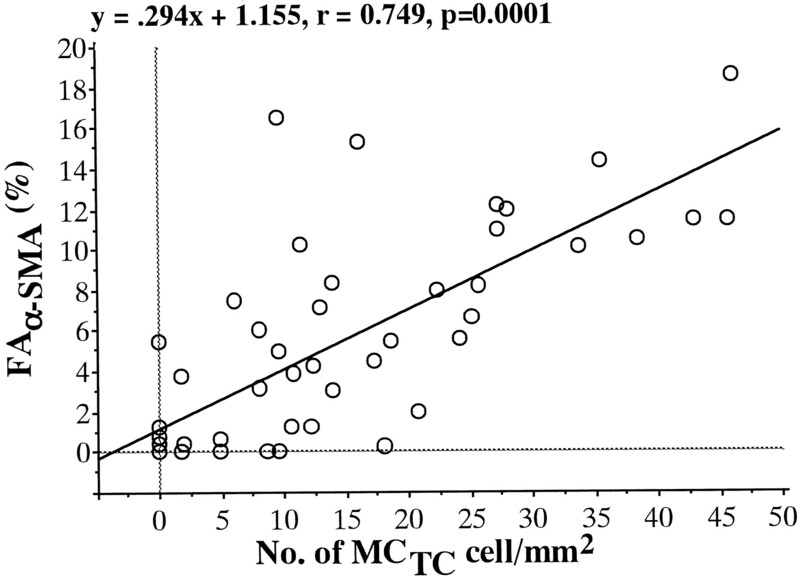 Accumulation of MC was significantly correlated with the numbers of T lymphocytes (MCT, r = 0.67) and interstitial macrophages (MCT, r = 0.455). There was also a significant correlation between the number of MCT and the relative interstitial area. The number of MCTC was well correlated with the fractional area of α-SMA-positive interstitium (r = 0.749) and the percentage of the interstitial fibrotic area (r = 0.598). There was also a significant negative correlation between interstitial MCTC accumulation and creatinine clearance (r = 0.661). The density of MCTC was higher (1.4-fold) in advanced forms of GN associated with fibrocellular crescents and interstitial fibrosis. These results show the potential involvement of MC in the fibroproliferative process in the renal interstitium of patients with RPGN. The results indicate that these cells constitute part of the overall inflammatory cell accumulation in RPGN. Tubulointerstitial (TI) lesions are considered prognostic features of various renal diseases. Despite numerous studies in human subjects and experimental animal models, the exact pathogenic factors involved in TI damage remain unclear. In particular, the role of mast cells (MC) in glomerulonephritis (GN) with TI lesions has not yet been fully analyzed. MC play an important role in allergic inflammatory conditions such as asthma, and their number is increased in chronic inflammatory conditions. Their presence in tissue is often accompanied by fibrosis, such as liver cirrhosis, pulmonary fibrosis, and wound healing, suggesting that they might be involved in these pathologic conditions (1,2,3). Activated MC synthesize, store, and release several bioactive mediators. For example, histamine and heparin are mitogenic for fibroblasts and induce collagen synthesis, as well as activating collagenase (12,13,14,15,16,17). MC are also known to secrete basic fibroblast growth factor in IgA nephritis (10). Using the in situ hybridization technique, Ruger et al. (11) demonstrated that human MC can produce type VIII collagen both in vitro and in vivo in diabetic nephropathy. However, whether MC modulate the inflammatory and fibrotic processes in GN remains to be elucidated. In this study, we evaluated the potential role of MC in the pathogenesis of TI lesions in rapidly progressive GN (RPGN), which is characterized by glomerular crescent formation, marked inflammatory processes, and TI fibrosis. Specifically, we examined the role of MC in the fibrotic process in TI lesions. RPGN was defined as glomerular disease with extensive glomerular crescent formation (>50%) associated with rapid loss of renal function (usually 50% reduction of GFR within 3 mo). Kidney tissue samples were obtained from 50 randomly selected patients (23 men and 27 women; mean age, 53.3 ± 15.7 yr) with crescentic GN at the time of renal biopsy. Only samples containing at least 10 glomeruli in the paraffin blocks were included in this study. All samples showed extensive crescent formation in >50% of the glomeruli. Histologic studies using light, immunofluorescence, and electron microscopy demonstrated typical extracapillary cell proliferation with crescent formation. Patients with RPGN were divided into three subgroups on the basis of the etiologic classification criteria of Couser (18) (Table 1). Control samples consisted of 20 randomly selected renal biopsy samples from patients with thin glomerular membrane disease, with normal extraglomerular renal structure and without immune deposition, glomerulosclerosis, or inflammation. All patients in both groups were adults (>16 yr of age). Clinical and laboratory data were recorded at the time of renal biopsy. The study protocol was approved by the Human Ethics Review Committee of Fukuoka University, and signed consent forms were obtained. Patients with RPGN were divided into two groups according the type of glomerular crescents. Stage I tissue samples (n = 25) contained fresh large cellular crescents around the glomerular capillary tufts, representing early stages of the disease process. Stage II tissue samples (n = 25) contained fibrocellular crescents in more than one-half of the crescentic glomeruli, representing a progressive glomerular process with or without interstitial fibrosis. Tissue sections were stained with hematoxylin and eosin, Masson's trichrome, periodic acid-Schiff, and periodic acid-methenamine-silver stains. To identify MC, sections were stained with toluidine blue. A portion of each biopsy sample was fixed in 1.4% phosphate-buffered glutaraldehyde, post-fixed in OsO4, and embedded in Epon resin. Ultrathin sections were cut and stained with uranyl acetate and lead citrate. All samples were examined by electron microscopy. Anti-human chymase rabbit IgG (protein-origin antibody) was obtained using the methods described previously (19). Peptide-origin monoclonal antibody for chymase was a kind gift from Drs. Y. Kiso and N. Ishihara of Suntory Biomedical Research Center (Osaka, Japan). Anti-human tryptase monoclonal antibody was purchased from Chemicon International (Temecula, CA). Anti-CD68, anti-CD20, anti-CD3, and anti-α-smooth muscle actin (α-SMA) monoclonal antibodies were purchased from Dako (Glostrup, Denmark). For immunohistochemical staining of the tissue samples, one part of each biopsy sample was fixed for light microscopy in 10% buffered formalin and was embedded in paraffin. Three-micrometer-thick, deparaffinized, serial sections were washed in 0.05 M Tris-HCl buffer containing 0.145 M NaCl, pH 7.5 (Tris-buffered saline [TBS]). Protease pretreatment was performed for staining for chymase and CD68, whereas autoclave pretreatment (121°C, 10 min) was performed for staining for α-SMA. Sections were initially treated with 1% skim milk (DIFCO Laboratories, Detroit, MI) and incubated for 1 h at 20°C with the first antibody (anti-chymase antibody, 50 mg/ml; anti-tryptase antibody, 0.32 mg/ml; each dissolved in 3% bovine serum albumin). For negative control staining, we used vehicle alone or nonimmunized animal Ig. After incubation, sections were washed with TBS and then incubated for 30 min with alkaline phosphatase (ALP)-conjugated second antibody against rabbit or mouse Ig (Dako). After washing, sections were incubated for 30 min with ALP-conjugated third antibody against ALP (Dako). The sections were then stained with a solution of 0.01% new fuchsin (Merck, Darmstadt, Germany), 0.01% NaN, 10 mg of naphthol AS-BI phosphate (Sigma Chemical Co., St. Louis, MO), and 0.1 ml of N,N-dimethylformamide (Wako, Osaka, Japan) in 40 ml of 0.2 M Tris-HCl buffer, pH 8.2. After being washed with TBS, sections were post-fixed in 2% buffered glutaraldehyde, counterstained with hematoxylin, and used for immunohistochemical detection. In a preliminary study, we immunohistochemically compared two different antibodies for human chymase, i.e., a peptide-origin antibody and a protein-origin antibody (Chemicon International). The results showed that the two antibodies yielded similar precisions; therefore, the protein-origin antibody was used in the following experiments. Tissue for positive controls consisted of biopsy samples from the small intestine for chymase and tryptase and the renal vasculature for α-SMA. After deparaffinized sections were treated with 0.005% protease (Dako-Japan, Osaka, Japan) for 10 min, they were incubated for 60 min at 20°C with the first mouse antibody against human chymase (Chemicon). After being washed with TBS, sections were incubated for 60 min at 20°C with tetrarhodamine isothiocyanate-conjugated second rabbit antibody against mouse Ig (Dako). Sections were then treated with 1% skim milk for 30 min to minimize the background levels. Sections were again incubated with the first rabbit antibody against human tryptase (BioPur Co., Switzerland), for 60 min at 20°C. After being washed with TBS, sections were incubated for 60 min at 20°C with FITC-conjugated swine antibody against rabbit Ig (Dako). 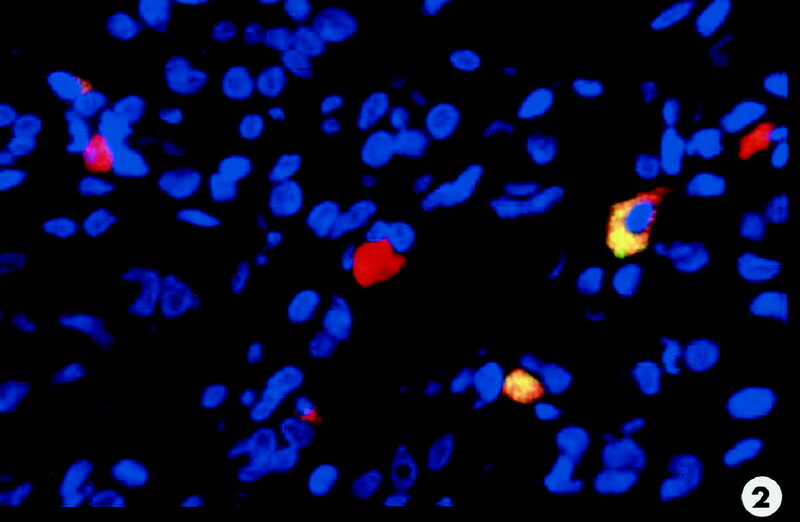 In the next step, nuclei were stained with 4′,6-diamidino-2-phenylindole (Sigma). Sections were then mounted and examined under a fluorescence microscope (Axioplan; Carl Zeiss, Jena, Germany), with a fluorescence imaging system (Isis; MetaSystems, Altlussheim, Germany). Several indices of the extent of the pathologic processes were derived using a previously published method (20). (1) A standard point-counting method was used to quantify the relative interstitial area (Aint) of the renal cortex. In this method, sections stained by the periodic acid-methenamine-silver method were examined under high magnification (×400), using a 121-point (100-square) eyepiece micrometer of 1 mm2. A total of 10 consecutive nonoverlapping cortical fields (area, 0.625 mm2) were analyzed in each section of the biopsy. Points overlying the tubular basement membrane and interstitial space were counted, whereas those falling on either Bowman's capsule or the peritubular capillaries were not. Points falling on glomerular structures or on larger vessels were excluded from the total count. The results were expressed according to the following formula: Aint = [(Number of grid intersections on the cortical interstitium/Total number of grid intersections) × 100]. (2) Interstitial immunoperoxidase staining for α-SMA was quantified by the point-counting method described above. The fractional area was also calculated, using the formula given above. (3) The fractional area stained by Masson's trichrome stain was quantified by the point-counting method described above, and the results were expressed as the fractional area using the formula given above. (4) The numbers of interstitial lymphocytes (CD20+ and CD3+) and macrophages (CD68+ and Ki-1+) present in the cortical interstitial area were counted, under high magnification (×400), in 10 adjacent nonoverlapping cortical fields (total area, 0.625 mm2/biopsy specimen). Only cells with a clearly identifiable nucleus were counted. Finally, the number of counted cells was expressed as cells per unit area (square millimeter). Data were expressed as mean ± SEM. Differences between groups were examined for statistical significance using the t test and one-way ANOVA. Association of categorical variables was examined using the χ2 test. Correlation between variables was assessed by linear regression analysis. A P value of <5% denoted a statistically significant difference. A representative tissue sample containing MCT is shown in Figure 1. Double staining for both proteases showed MC positive for tryptase only, whereas others were stained for both tryptase and chymase (Figure 2). Chymase was not observed in cells lacking tryptase. MC were mostly round in shape, with a central nucleus and abundant cytoplasm containing numerous tryptase- or chymase-positive granules (Figure 3, inset). 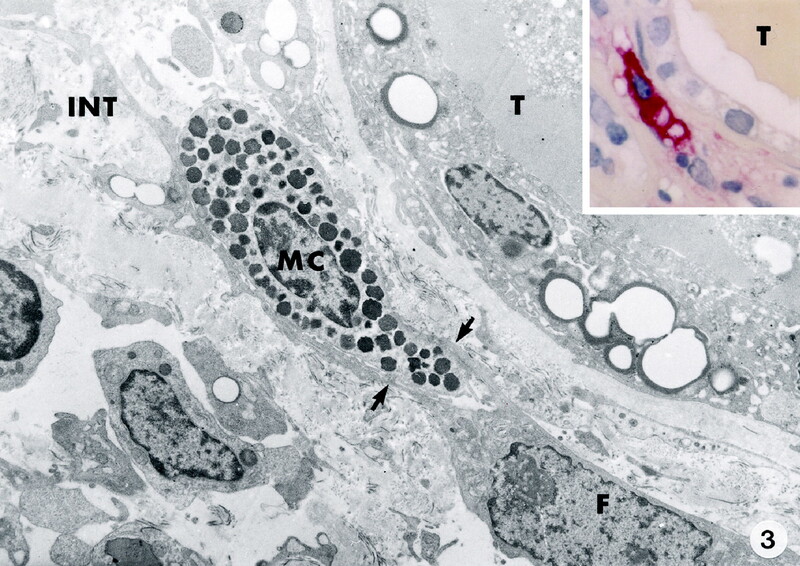 A proportion of MC appeared elongated, with cytoplasmic processes, and contained fewer granules. Electron-microscopic examination clearly demonstrated the presence of numerous intracytoplasmic dense granules (Figure 3). MC were localized in the peritubular or periglomerular region, in close proximity to interstitial fibroblasts (Figure 3), and were surrounded by cell processes of fibroblasts. Intraglomerular MC were never detected in our tissue samples, although a few intratubular MCT and/or MCTC were found. MC were mostly located on the periphery, rather than within areas of lymphocytic accumulation. Furthermore, MC were observed around interstitial CD68+ macrophages and α-SMA-positive interstitial areas (Figure 4). 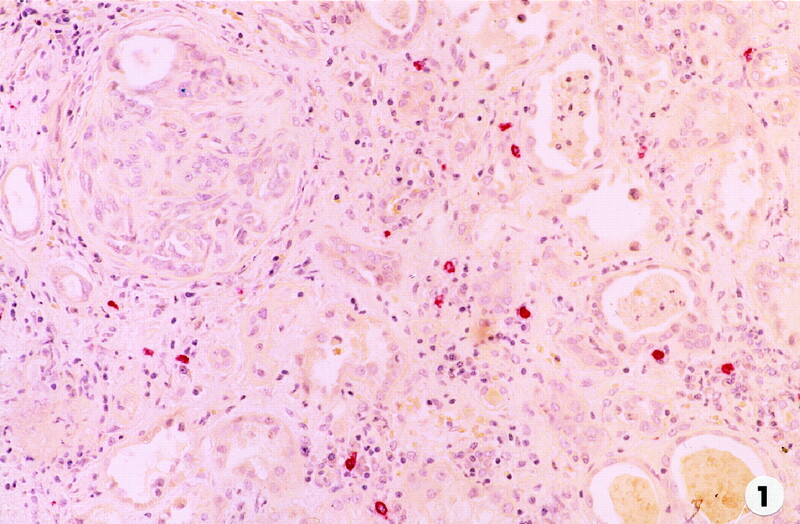 Photomicrograph showing diffusely distributed tryptase-positive mast cells (MCT) in the renal interstitium. Magnification, ×200. Photomicrograph showing both phenotypes of mast cells (MC). The MCT phenotype is indicated by rhodamine-labeled tryptase particles (red). The tryptase- and chymase-positive (MCTC) phenotype is shown as yellow, mixing the rhodamine-labeled tryptase (red) and FITC-labeled chymase (green). Note the absence of only chymase-positive MC. Double immunostaining; magnification, ×200. Photomicrograph showing peritubular (T) MC. An oval-shaped MC completely filled by electron-dense granules is in the interstitium (INT). The MC is partially surrounded by cytoplasmic processes (arrows) of a peritubular interstitial fibroblast (F). Electron microscopy; magnification, ×6000. Inset, granulated MCT. Immunostaining; magnification, ×1000. 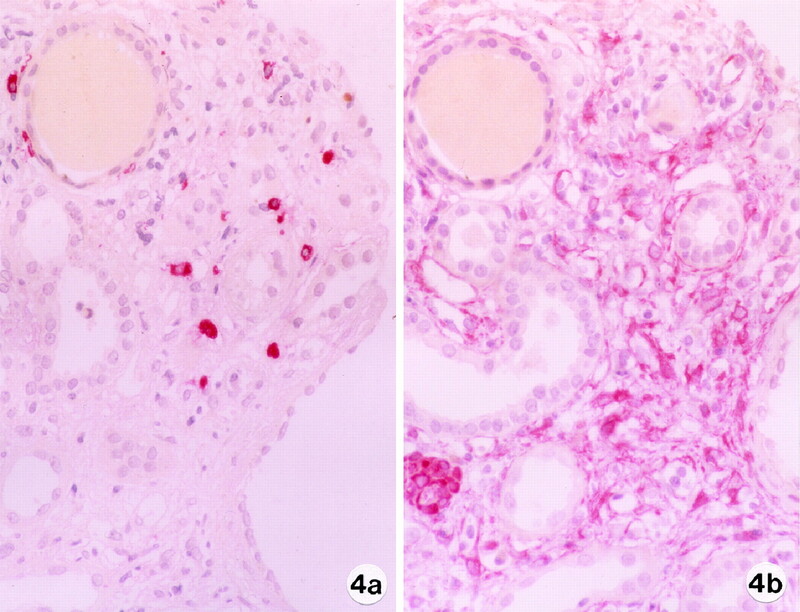 Two serial 3-μm sections of a rapidly progressive glomerulonephritis (RPGN) renal biopsy, immunostained for chymase (a) and α-smooth muscle actin (α-SMA) (b). Note that MCTC accumulation is colocalized with the α-SMA-positive myofibroblast proliferation area. Magnification, ×400. The densities of both MC phenotypes were significantly higher in the RPGN group than in control samples (MCT, 43.7 ± 4.6 versus 7.1 ± 1.3/mm2; MCTC, 13.8 ± 1.86 versus 1.9 ± 0.86/mm2). Specifically, the MCT phenotype was the predominant MC type, whereas fewer MCTC were found in the study group. Furthermore, MC constituted the third most abundant interstitial inflammatory cell population in RPGN (Figure 5). Figure 5 shows the distribution of both MC types in relation to the development of RPGN. The numbers of MC in different types of RPGN were not significantly different and were less than the numbers of T cells. Distribution of renal interstitial inflammatory cells in cases of RPGN, according to etiologic differences. Mo/Ma, monocytes/macrophages. We also analyzed the distribution of different MC subsets according to the histologic stages of RPGN. No major difference was observed in the number of MCT (41.8 ± 6.5 versus 45.8 ± 6.7/mm2). However, the mean number of MCTC was higher (1.4-fold) in stage II than in stage I (11.4 ± 1.9 versus 16.2 ± 3.1/mm2, P > 0.05), although the difference was not statistically significant. In stage II, representing a progressive form of RPGN, inflammatory cells (T cells, B cells, and macrophages) were more abundant than in stage I, but the difference was not significant. We also analyzed the correlation between the MC phenotype and the pathologic findings. There was a significant correlation between the percentage of glomerular crescents and the number of MCT (r = 0.497, P < 0.001). Furthermore, there was a significant correlation between the number of interstitial T lymphocytes and the number of MCT (r = 0.67, P < 0.0001), as well as that of MCTC (r = 0.719, P < 0.0001). However, there was no relationship between the density of B cells and the numbers of MCT and MCTC (r = 0.358 and 0.238, respectively; P > 0.05). There was a significant correlation between the number of interstitial CD68+ macrophages and the numbers of MCT (r = 0.455, P < 0.001) and MCTC (r = 0.646, P < 0.0001). A significant relationship was detected between the relative interstitial volume (reflecting all changes associated with interstitial expansion, such as edematous expansion, focal fibrosis, and inflammatory cell accumulation) and the number of MCT (r = 0.45, P < 0.0014). A close relationship was observed between the fractional area of α-SMA staining and the number of MCTC (r = 0.749, P < 0.0001) (Figure 6), but this relationship was weaker with MCT (r < 0.525, P < 0.0001). The fractional area of fibrosis was significantly higher in stage II RPGN than in the early stage (stage I) of the disease (10.8 ± 9.4 versus 23.7 ± 14.9%, P = 0.0006). In addition, there was a significant correlation between the fractional area of fibrosis and the number of MCTC but not that of MCT (r = 0.598, P < 0.0001, compared with r = 0.269, P > 0.05). Correlation between the number of MCTC and the fractional area of α-SMA-positive cell proliferation (FAα-SMA). The number of MC was not influenced by age or gender but was significantly correlated with serum creatinine clearance, particularly for MCTC (r = 0.661, P < 0.0001). Furthermore, significantly greater numbers of MCTC were detected in patients with hypertension (> 165/95 mmHg, n = 16), including MCTC (22.4 ± 15.3 versus 9.7 ± 9.8/mm2, P < 0.0001). The major finding of this study was the significant accumulation of both MC phenotypes in RPGN (sixfold), compared with control cases. Although MC have been demonstrated previously in renal diseases (6,7,8,9,10,11), to our knowledge this is the first demonstration, using the double immunostaining method, of the simultaneous presence of both MCT and MCTC phenotypes in RPGN. Accumulation of MC in the interstitium was significantly correlated with the loss of renal function, as reported for other renal diseases (9,10), and was well correlated with TI damage. In the early stages, RPGN is histologically characterized by extracapillary glomerular epithelial cell proliferation associated with intra- and extraglomerular inflammation. However, with the progression of the disease process, histologic examination usually shows fibrocellular and then fibrous transformation of the glomerular crescents, together with TI damage, including interstitial fibrosis. Our data suggest the presence of MC in both stages of renal lesions, but the MCTC phenotype is more frequently (1.4-fold) present in the late stage than in the early stage. Despite the report in 1960 of the detection of MC in “subacute GN” (7), the mechanism by which MC proliferate in the interstitium in RPGN is still not known. Consistent with the results of recent studies (6,7,8,9,10,11), our findings showed that MC were localized in the renal interstitium but not in the glomerular tufts or spaces. Although our results showed a good correlation between the number of MC and the frequency of glomerular crescents, the distribution of these cells indicated that MC accumulation was correlated more strongly with TI injury than with glomerular lesions. More importantly, we also demonstrated a strong correlation between the number of MCTC and TI damage of RPGN, including inflammation, myofibroblast proliferation, and fibrosis. The results depicted in Figure 5 showed no differences in the accumulation of MC and that of other types of inflammatory cells in different types of RPGN. These results suggest that infiltration of MC is an integral part of the inflammatory process, rather than a specific process in these renal diseases. In this regard, previous studies have convincingly demonstrated that the pathologic processes in these nephropathies are dependent to a large extent on inflammatory cells, especially T cells and macrophages (21,22). Although no correlation was observed between the accumulation of MC and that of B lymphocytes in previous studies (9,10,11), histologic examination and morphometric analysis in this study revealed a close relationship between the accumulation of MC and that of T lymphocytes. Previous in vivo and in vitro studies established that MC maturation and activation is regulated by products of T lymphocytes (e.g., interleukin-3 and interleukin-4) (23,24). Therefore, it is possible that infiltration of T cells in the interstitium in RPGN might directly or indirectly increase MC ingress from the circulation, as well as MC maturation and activation. Furthermore, it has been demonstrated that tryptase can also increase microvascular permeability (25), enhance inflammatory cell transmigration (26), and stimulate maturation as well as cytokine release (5,27). Additional studies are necessary to determine whether MC or lymphocytes can initiate the induction of interstitial inflammation and whether activated T cells within the diseased kidney synthesize molecules that participate in MC proliferation and maturation or vice versa. Although our analysis demonstrated a close structural and statistical relationship between monocyte/macrophages and MC, similar to previous data on human lung MC activation by macrophage inflammatory protein-1α (28), the functional relationship between these cells in renal diseases is still not clear. In this study, we found colocalization of accumulated MC and α-SMA-positive myofibroblasts, indicating that MC may be involved in the fibrotic process in RPGN. Previous studies described the presence of MC in fibrotic areas of various organs (1,2,3,29,30). For example, Li et al. (30) found that cardiofibrosis was more severe when a large proportion of MC were present in heart transplants. Furthermore, Lajoie et al. (9) demonstrated a strong relationship between the number of MCT and interstitial edema, as well as fibrosis, in renal allografts. However, in another study, despite the significant (10-fold) accumulation of MC, Colvin et al. (6) did not detect any correlation between interstitial damage and the accumulation of MC in chronic rejection in renal allografts stained with toluidine blue. The discrepancy between these results might be attributable to different methods used for the identification of MC. Despite the in vitro effects of MC on the development of fibrosis (31,32), the role of MC in fibrogenesis in GN has not been demonstrated. In this analysis, there was a significant correlation between the accumulation of both phenotypes of MC (particularly the MCTC phenotype) and the degree of interstitial fibrosis. The density of MCTC in the late stage of RPGN was higher than that in the early stage. Whether selective proliferation or activation of a MCTC subpopulation occurs in RPGN remains to be elucidated. Consistent with previous observations (10), we also found a close structural relationship between MC and interstitial fibroblasts (Figure 3, inset). The latter cells are known to take up MC granules (33), followed by phenotypic modulation of MC by cytokines (34). Furthermore, MC products (e.g., tryptase, chymase, and histamine) have mitogenic activity for fibroblasts and enhance collagen synthesis (12,13,14,16,17,32,35). Recently, mitogenic basic fibroblast growth factor was detected in renal MC cytoplasm in biopsy specimens from patients with IgA nephritis (10), suggesting the potential fibrogenic role of MC in IgA nephritis. On the other hand, in vitro and in vivo analyses demonstrated that MC products such as heparin and tumor necrosis factor-α influence α-SMA expression (32,35). Ruger et al. (11) observed periglomerular accumulation of MC, type VIII collagens, and α-SMA-positive cells in diabetic nephropathy, suggesting that MC may upregulate renal fibroblasts expressing α-SMA. These activated fibroblasts (myofibroblasts) are well known as the cells responsible for extracellular matrix production (36,37) in renal fibrosis. Our results demonstrated a significant correlation between the accumulation of both phenotypes of MC and the fractional area of α-SMA staining, suggesting that the role of MC is not only in the early inflammatory process but also in the late fibrotic renal process in RPGN. In summary, this study demonstrated that MC accumulation is a feature of a more aggressive form of RPGN and that such accumulation may be an important mechanism for amplifying MC-mediated renal injury. Additional studies are necessary to clarify the exact role of MC in renal inflammatory and fibroproliferative processes. Understanding the mechanisms for MC interstitial inflammation and fibrosis may facilitate the design of new therapeutic strategies for the treatment and prevention of GN progression. We are grateful to Drs. Y. Kiso and N. Ishihara of the Suntory Biomedical Research Center (Osaka, Japan) for providing anti-chymase antibody. We also thank Noriko Kawamoto and Masako Ishiguro for skilled technical assistance and Dr. F. G. Issa (Word-Medex, Sydney, Australia) for careful reading and editing of the manuscript.